Happy Tuesday-Wednesday, everyone, from the world-wide headquarters (WWHQ) of the Corvallis Knights, your 2016 West Coast League champions! 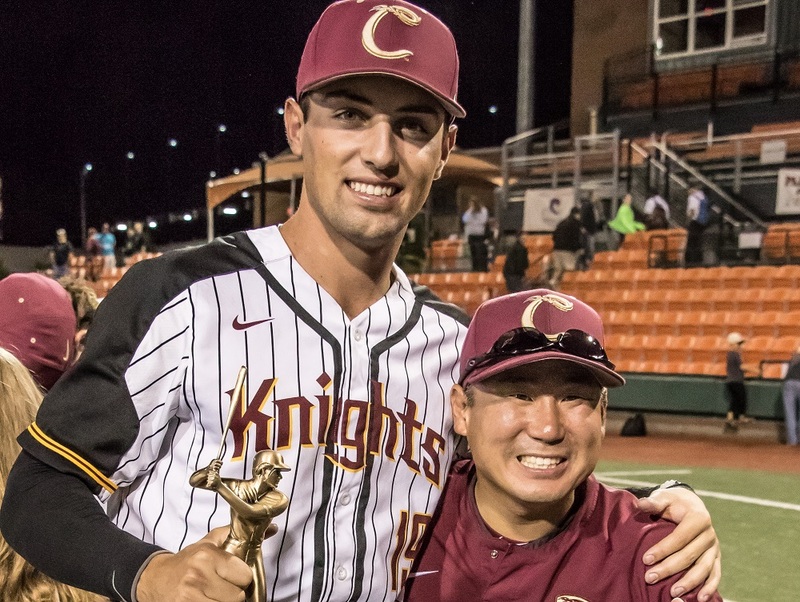 Nice story on Knights’ pitcher Austin Crowson of Monroe High School/Lane CC by reporter Steve Mims of the Eugene Register-Guard. A Nevada-Reno signee for 2017-18, Austin was selected by the New York Yankees last week in the 26th round of the MLB draft and is still considering his options. Please click here to read it. Speaking of our pitching staff, it received a huge boost this week with the addition of Cole Spear and Miles Glazier from UC Irvine, Connor Redmond from Cal Poly and Trenton Toplikar from UC Riverside. Last night, Spear made his Knights’ debut with 3.1 innings of scoreless relief in the 10-3 win over Cowlitz. He struck out seven, allowed two hits and was credited with the victory. Glazier pitched a perfect ninth in his first appearance, fanning the final two hitters. 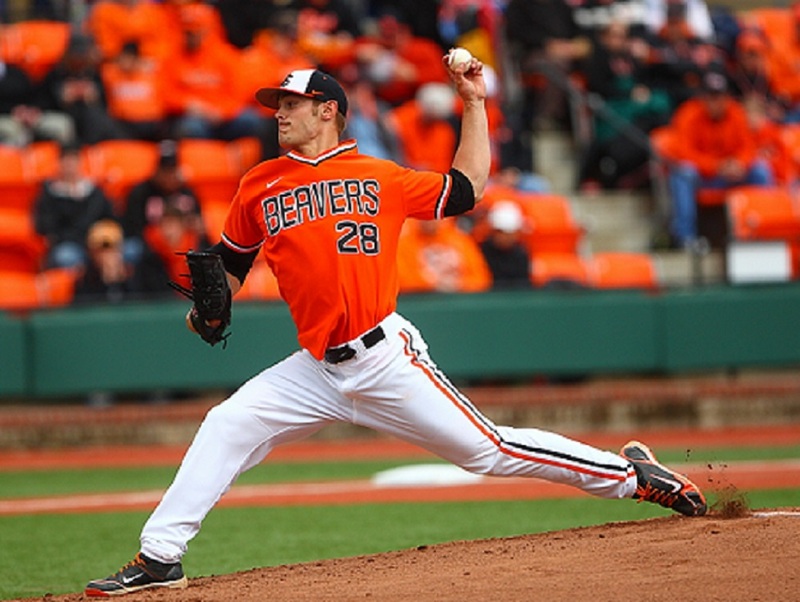 On Sunday, Redmond went two perfect innings against the Black Bears. On Saturday, Toplikar went 2.2 scoreless innings against Cowlitz. So, if my math is correct, that’s nine shutout innings altogether, and that’s a good thing. Monday’s game with Cowlitz drew 737 fans. Our total attendance for seven home dates is now 9,400. That’s 1,656 fewer than last year at a corresponding date. The Knights head to Victoria today for a 6:35 p.m. game with the HarbourCats at Royal Athletic Park. Righty Louis Crow of San Diego is our projected starter, opposed by Washington State lefty AJ Block (2-0, 1.25). The series concludes on Wednesday and Thursday. Jordan Horak of Portland is Wednesday’s starter; the aforementioned Trenton Toplikar is our projected starter on Thursday. The Knights return home for a Friday-Sunday series with Bellingham, a rematch of the 2016 WCL Championship Series won by the Knights. Corvallis took 2 of 3 against the Bells in Bellingham on June 9-10. Remember, Saturday is Samaritan Health Services Fireworks Night, with a special 7:15 p.m. start time. Get your tickets now! Outfielder Austin Shenton of the Bellingham Bells and Western Oregon University freshman pitcher Kade Mechals of the Kelowna Falcons were named the West Coast League Player and Pitcher for the week of June 12-18. Shenton, who starred this past spring at Bellevue College (JC), leads the WCL in batting with a sizzling .548 average. The sophomore-to-be at Florida International and Bellingham native went 9-for-13 this past week with a homer and eight RBIs for the WCL North first-place Bells. Mechals tossed a gem in his Kelowna debut twirling eight scoreless innings vs. Yakima Valley on June 18 to earn the win in the Falcons 2-1 home victory. Mechals allowed four hits while walking one and striking out five. 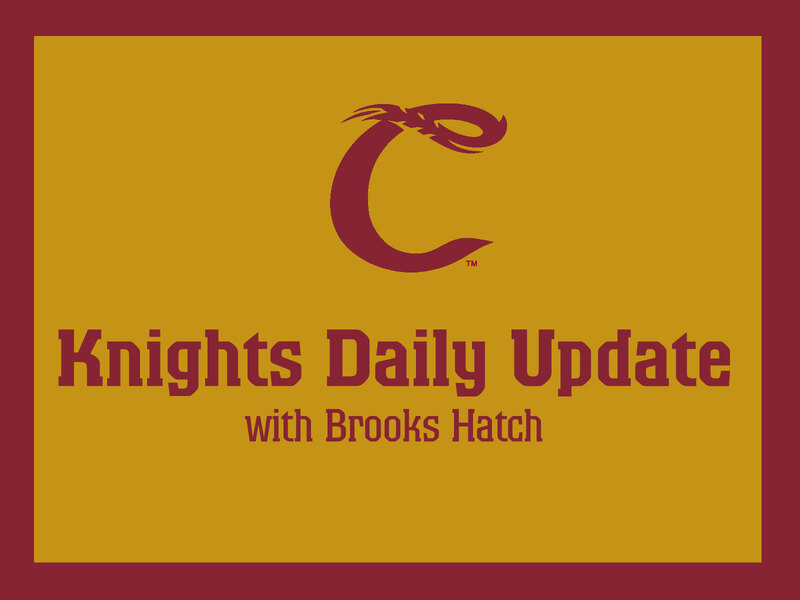 Charlotte (A Florida State, Rays) first baseman Dalton Kelly (2014) was 2-for 3 with a run and a double in a 5-0 win over Palm Beach on Monday to earn Corvallis Knights Minor League Player of the Day honors. He played at UC Santa Barbara. Reno (AAA Pacific Coast, Diamondbacks) pitcher Jimmie Sherfy went .1 innings and recorded his ninth save in a 9-4 win over Las Vegas, lowering his ERA to 1.37. He played at Oregon. Jupiter (A Florida State, Marlins) pitcher Ben (formerly Wetzler) Holmes (2011) had two scoreless innings, struck out three and earned his third hold in a 4-3 win over Fort Myers. He played at Oregon State. That’s all for today. See you on Thursday.